Every year, REGC solicits proposals from individuals or organizations. We select the proposals that best fit our mission and values, and gift to those individuals/organizations. Your donation of $250 or more entitles you to help select these organizations/individuals. As a member of the AAPIP National Giving Circle Network, REGC is committed to fund different organizations or individuals every year. Our goal is to raise at least $10,000 a year, apply for matching funds so we can leverage our resources, and gift it all away. In our first year (2012-2013), REGC raised $5,000. This was matched by the Gill Foundation and AAPIP and all the funds were gifted to the following four deserving organizations. To read about our grantees' testimonials, please click on Testimonials page. PROJECT: Upgrade the Coming Out, Coming Home DVD. This is the most often requested resource. Originally distributed in 1996, it is dated. The funding will be used to shooting interviews and post-production. PROJECT: Preserve and record oral histories of what love meant to those who fought not just for their sexuality within the API community but also against racism and misogyny from white lesbians and gays. 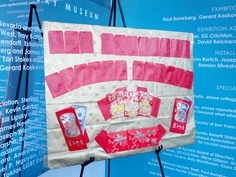 A traveling exhibit will be created and exhibited at the Chinese American Museum in Los Angeles. PROJECT: Provide a traditional dance workshop for Pacific Islander women who are over 30 years of age. A crucial and necessary part of Pacific Islander people's healing is in the reclaiming of their traditional arts and practices. One of the traditional tools that are of great importance to Pacific Islanders is traditional dance, which encompasses chant, music, traditional instruments, relearning native languages and storytelling. PROJECT: “Spirit: Re-imagining a Century of Queer Asian American activism” (working title) is a performance/panel discussion that aims to create positive social change for LGBTQ Asian Americans. “Spirit” will feature 15 Asian American artists and activists, with content reaching from 1900’s Angel Island to 1940’s Japanese American Internment, to 1960’s Third World student strikes/API lesbian activism, and beyond. “Spirit” aims to bring together community to honor our histories, to acknowledge those whose shoulders we stand on, and to envision our future together.